This wooden frame church was constructed and dedicated August 8, 1889, and was in continual operation until 2014. The Reverend George Bounds organized it in 1888. 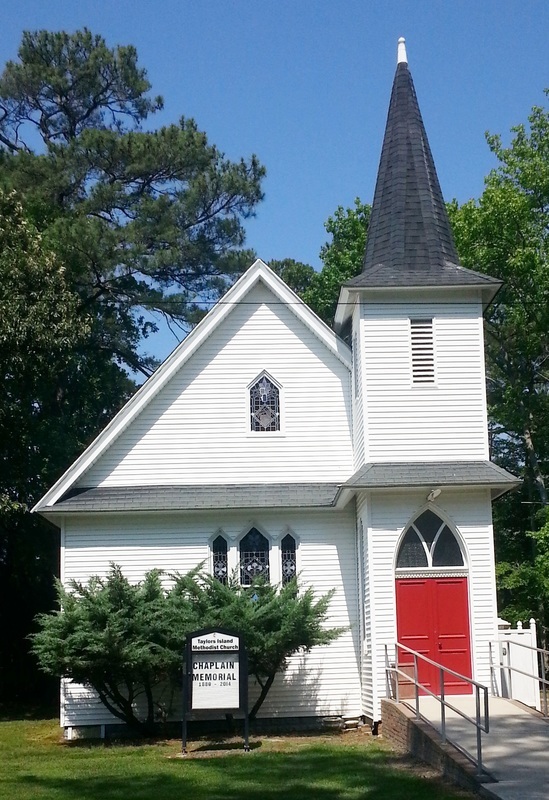 The church was named for Reverend Dr. John F. Chaplain and served the Methodist Protestant denomination. Rev. John F. Chaplain was born 1821 in Talbot County, and was the descendent of Isaac Chapline (later changed spelling to Chaplain) who landed in the Jamestown, VA area about 1622. Another son of Isaac settled in Calvert County, MD. Other churches on Taylors Island during this period were the Bethlehem Methodist Episcopal Church, the Grace Episcopal Church, and the Lane Methodist Episcopal African American Church. The one-quarter acre of land on which this church was built was donated by Jeremiah and Annie Keene Spicer in 1887. Jeremiah was the son of Travers Spicer and was born about 1838. This deed was recorded in Liber CL #10, folio 361, 362, and 363, recorded 12/13/1887. The deed records the names of the church trustees who received the land as Thomas Lambdin, W. James Thompson, John T. Barnes, Robert F. Lambdin, R. F. Noble, John H. Robinson, Levin J. Spicer (Jeremiah’s brother), and Travers S. Thompson.